I’ve worked on puzzle-draw a bit; there’s now an incomplete and experimental more generic input format, which should eventually allow you to draw graphics for non-hardcoded puzzle types. Including doing things like using other symbols instead of numbers where number clues are currently expected. Be sure to take part in the Puzzle Grand Prix next weekend, authored by Jonas Gleim and me. There should be some nice puzzles in there. Check out the instruction booklet. We’ve published a puzzle book via the German Logic Masters, with a chapter of Minesweeper puzzles by myself. There’s a number of prominent constructors involved! (It’s not really being marketed to expert puzzlers, which I suppose explains that the publisher doesn’t even bother to note the involvement of serial world champion Ulrich Voigt.) It’s claimed to be available already, though there’s some information it won’t ship before March. Have a look inside at topp-kreative.de or check it out at amazon.de or amazon.com. 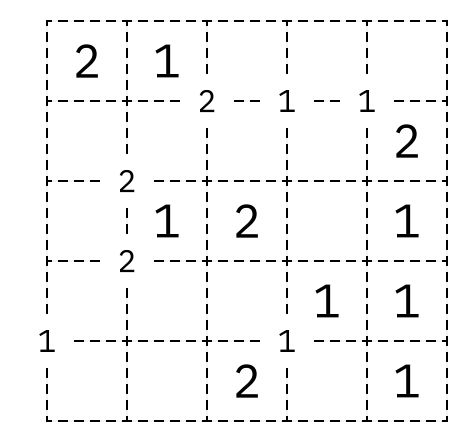 Finally here’s the puzzle: Rules Draw two loops that consist of horizontal and vertical segments. One loop goes along the grid lines, while the other loop goes from cell center to cell center. Clues indicate how many of the (up to) four adjacent edges have an intersection of both loops. This entry was posted in Puzzles and tagged dual loop, medium on 2019-02-12 by rob.